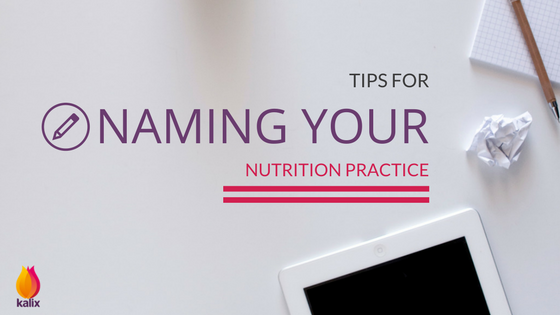 Tips for Naming Your Nutrition Practice – The Official Kalix Blog. 1 – What URLs are available? – This is of significant importance because you will eventually need a practice website. You want to choose a name that reflects a website address that is currently not being used by another entity. 5 – Who is your ideal client? – Consider the types of people you plan to service, whether it be children, teenagers, young adults, pregnant women, the-3o-somethings, male desk jockeys, middle-aged women, the elderly…What type of names will appeal to the target group? 2 – Who are you as a dietitian/nutritionist? – Are you focusing on specific conditions e.g. diabetes, weight management, food sensitivities or more on a holistic aspect of nutrition? When analyzing this, consider asking yourself what type of approach you will be offering your clients. 3 – What is your practice model? -What will clients experience during your appointment sessions with them? 4 – What names feel really exciting to you? – Think of what intrigues you and what truly expresses the passion and enthusiasm you possess for your business. Next, consider the fact that there are various types of practice names for you to choose from. They include Location-Based, Specialty-Based, Name-Based, Personality-Based, and Process-Based. Let’s delve into each to help you understand each and the least recommended of all 5. No matter which name you decide, please keep in mind that your private practice is a complete reflection of who you are as a person. It is your permanent brand. It should reflect positive aspects of you and your business that will make potential clients curious about your services.